Located on the top of the Tianzhu Peak, the main peak of Wudang Mountain, Hubei Province, the Golden Hall (武当山金殿) was built in the 14th year of Yongle reign (1416) of Ming Dynasty. 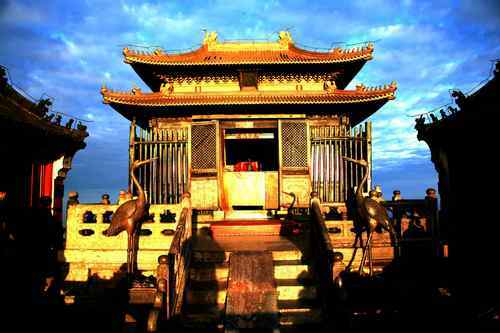 The Hall is the biggest gilded copper temple in China, and is 5.54 meters high, 4.40 meters wide and 3.15 meters deep. All statues and tools are made of bronze. The most valuable statue is the bronze statue of Zhen Wu, another name for the Northern Emperor, Beidi, a popular Daoist deity. Between them, the statues and hall represent the best of Ming Dynasty copper work. Visitors can also revel in the natural surroundings, taking in magical sunrises and sultry dusks. - Hours: 7 a.m. – 5 p.m.
- How to get there: take a bus at Wuchang Railway Station.